Television’s much loved character from the 1970’s drama series Kojak is back in this new version of the series. 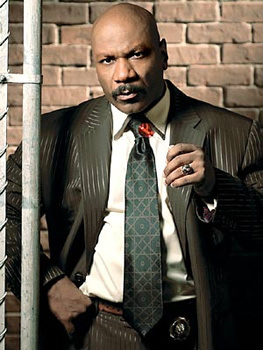 NYPD Lieutenant Theo Kojak (Ving Rhames) cares deeply for victims and immerses himself in thier cases. He’s a smartly-dressed jazz-lover with a sweet tooth and makes his own rules when investigating criminals, much to the chagrin of his former partner and now boss Captain Frank McNeil (Chazz Palmerteri). But McNeil knows the passion and talent the man behind the designer duds has and lets Kojak handle his cases the way he does best, even if it means trouble for McNeil from his superiors. Guiding Kojak through the legal process of his investigations of prostitutes, robberies, and homicides is Assistant District Attorney Carmen Simone (Roselyn Sanchez). IN addition to working with him, she also shares a romantic relationship with Kojak outside of the police department. Their relationship is as complicated as the crime scenes they inspect and Simone often feels she takes a back seat to the criminals Kojak is so hell bent on bringing to justice. Also wanting to put those committing crimes behind bars is the new cop of the precinct, Emily Patterson (Sybil Temtchine). She’s keen to pick up what Kojak has been doing so successfully and stylishly for years. After spending time with Kojak, she learns how strongly he believes that life’s too short to waste in prison… or in a cheap suit.